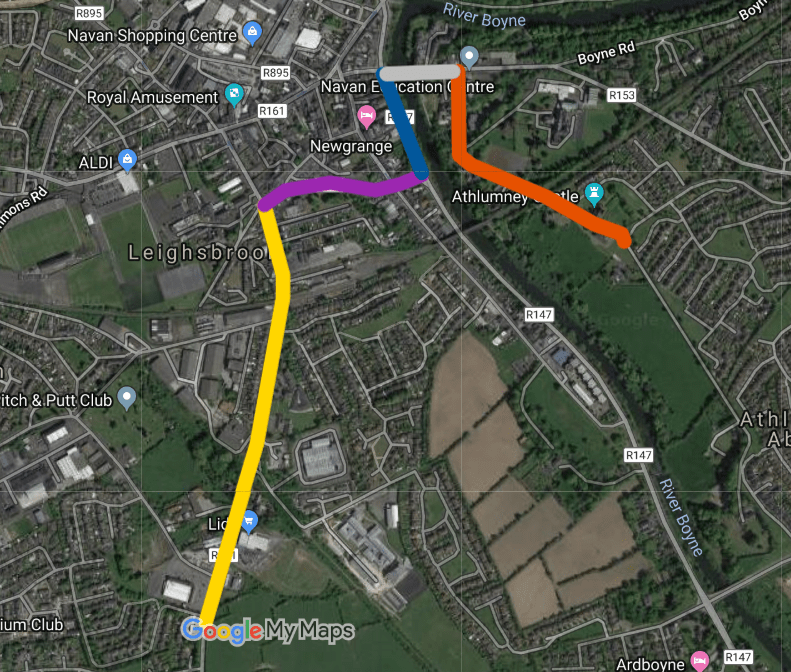 COMMENT & ANALYSIS: Meath County Council is planning two linked new pedestrian and cycle routes in Navan — although it will only amount to around 3km, it will mean connecting different residential areas with a number of schools and the town centre and that’s a good start for a cycle network. 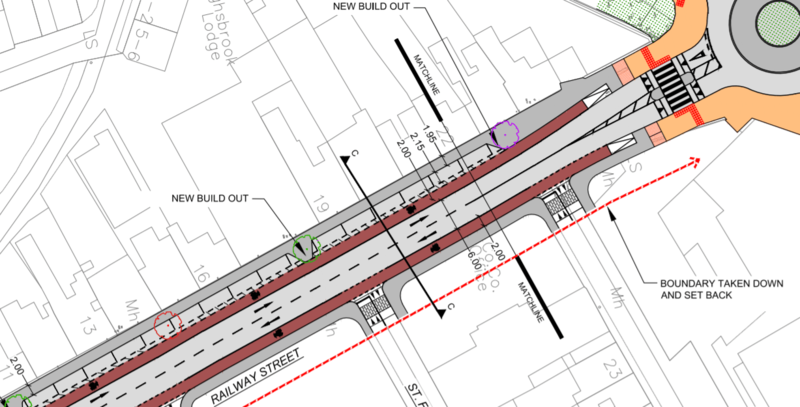 According to the council, the Athlumney to Trim Road Cycle and Pedestrian Scheme includes “2.9km of segregated cycle and pedestrian facilities”, however, the drawings for the project shows that it includes sections of shared footpaths, shared roadway, non-segregated cycle lanes, and segregated cycle tracks. The route is made up of a few connected segments — 1km along the Trim Road and Railway Street (yellow section below), under 400 metres on the Circular Road (purple below), 240 metres on the Kells Road (blue), about 600 metres on the Convent Road (red), and 170 metres of a bridge and widening as part of another scheme (grey). 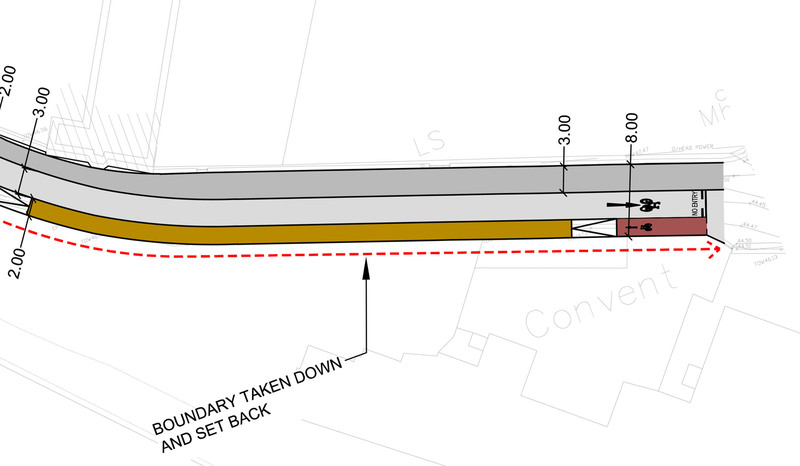 The grey section connects the two sections currently up for consultation. The drawings and report relating to the project can be viewed in full at consult.meath.ie, where there’s details of the consultation which closes at 4pm today, Tuesday November 13. The plan is better than most retro-fitted projects which have been built in many towns around Ireland. Rather than just painting lines where the space allows it, the routes includes new kerb lines for footpath and cycle tracks, and setting back of boundaries to provide enough space for cycling and walking. 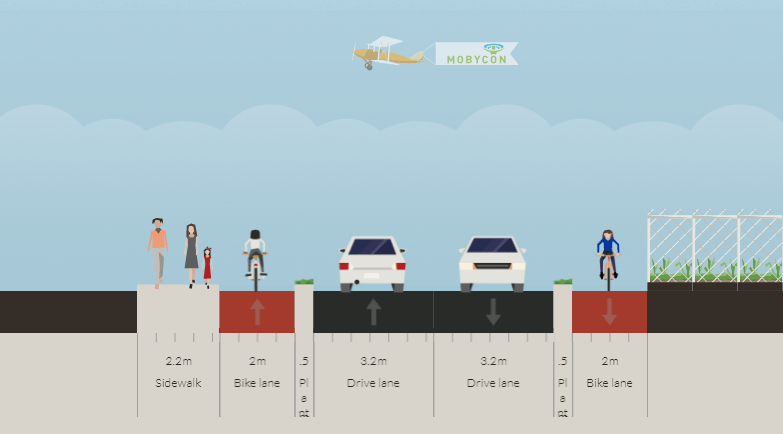 Given the widths shown in the above images the shared cycling and walking paths (sandy colour) are unnecessary and should be replaced with seprate space for walking and cycling. 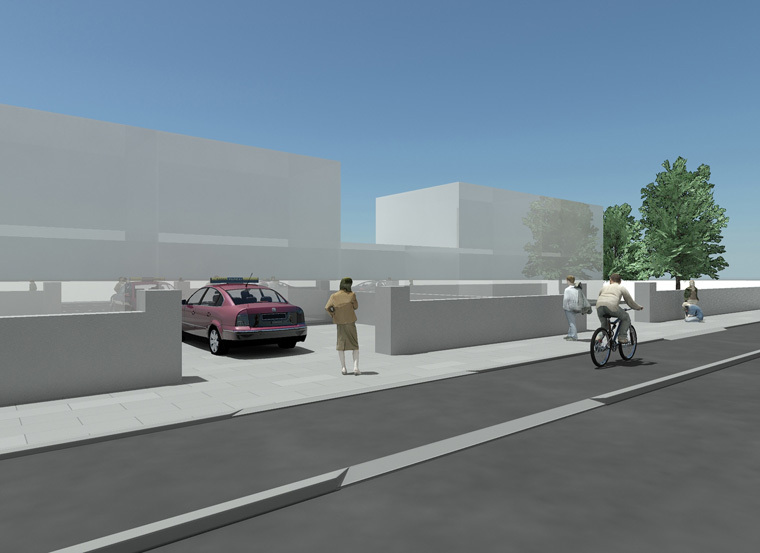 The first of the two images above is what’s proposed by the council and the second image is one possable alternative. Unlike the council’s plan our alternative takes horizontal segregation into account — which makes thinks safer and feel safer too. Just because horizontal buffers cannot be provided everywhere is not a reason not to increase the quality of service where it is possable, even for small sections. In any case, cycling needs clear and direct access to be provided in all directions — as the arrows above shows there is not direct access in the drawings as drafted. A short distance away are two T-junctions — the Dan Shaw Road (centre) and the access road into Lidl (bottom right). There’s also the petrol station with two entrances — it’s unclear how these work within the T-junction which is upgraded to include traffic signals. The cycle lane should only be broken-lined at junctions and entrances — the cycle lane should be a solid line closer to the junction than shown, but really the cycle tracks should extend to the junctions, especially in the directions going away from the junctions. 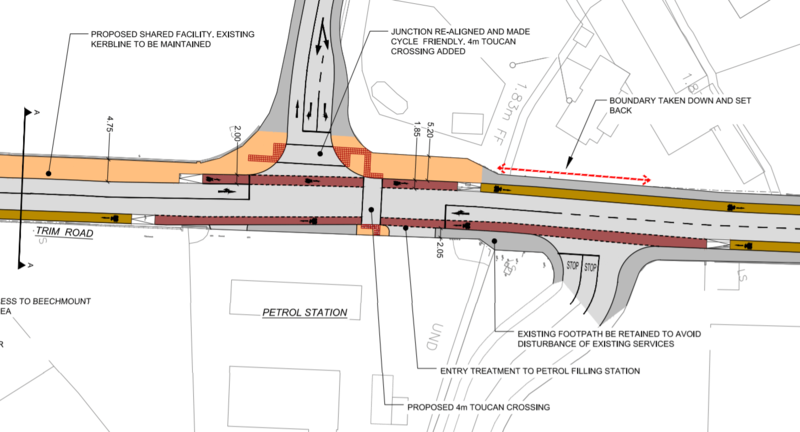 It is unclear how people cycling are expected to turn right into the Dan Shaw Road, if the toucan crossing is to be used, it should be moved to the left of the crossing on the image above. This avoids people having to use two crossings to make what should be just one turn. 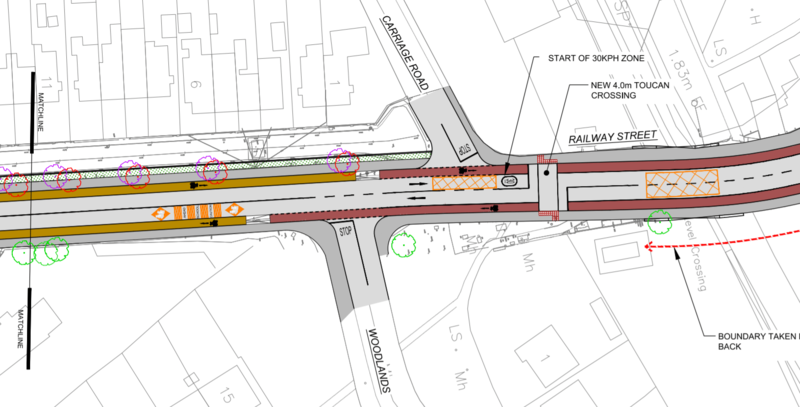 The T-junction into Lidl needs to be looked at if it is compliment with the Manual For Urban Roads and Streets and a pedestrian crossing of some type added across the side road, if not signalised it should be raised. Further on, this T-junction includes access to a Gaelscoil, a secondary school, housing and business units. The toucan crossing is also on the wrong side if it’s expected to be used by people cycling turning into the side road. It also needs to be looked at if it is compliment with the Manual For Urban Roads and Streets and a pedestrian crossing of some type added across the side road, if not signalised it should be raised. With the general width shown in the last map drawing, the above cross-section is probably the best solution (one footpath is wider in this cross-section image, but according to the last drawing, it’s not this wide along most of this section). Avoiding chopping down all of the trees, the available space gets quite narrow — an alternative here to provide for a higher level of safety and service would be to use Connolly Avenue as a service street with bicycle access or a small section of “bicycle street”. 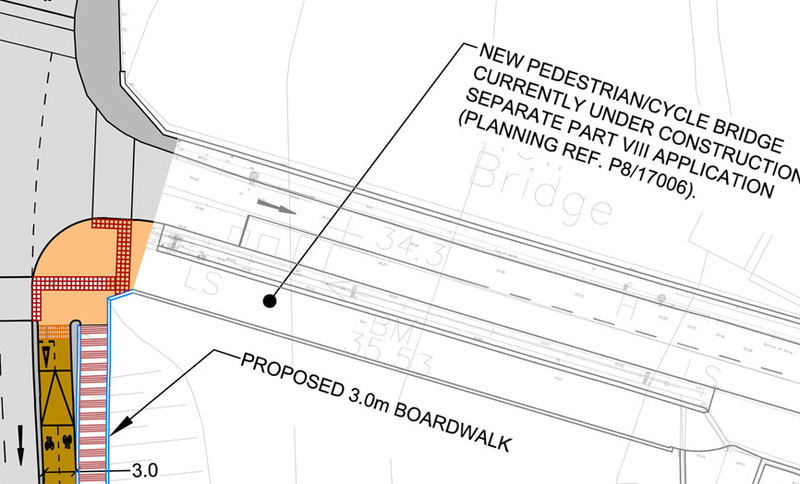 This would free up space to make the footpath and cycle path wider on the other side of the road and include a buffer between the cycle path and carriageway. If a service street / bicycle street design is used, it needs to be carefully designed and include seamless transitions from cycle track to service street back to cycle track before the next junction. 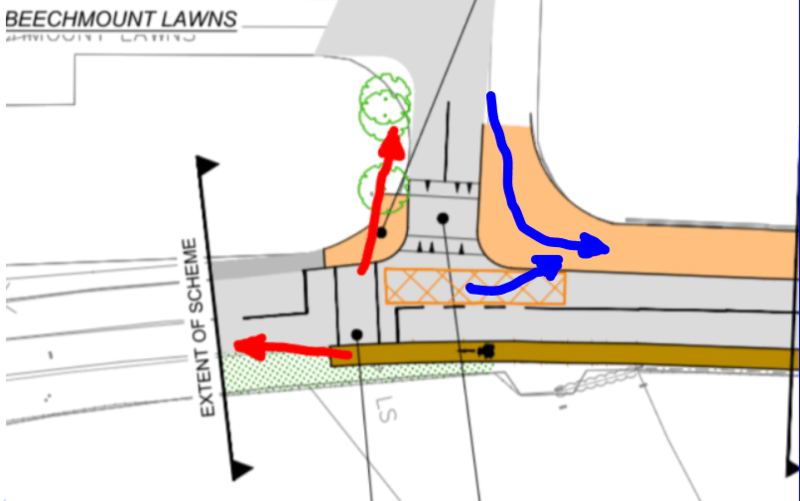 The design includes a set down or bus area inside the footpath and cycle track (the set down area is highlighted here with a blue line) — this should be re-design to be a bus stop bypass arrangement. People cycling — especially children — should not be exposed to the craziness of school drop offs by car or buses turning in and out with possibly poor sight-lines. Just because the 30km/h speed limit starts does not mean the cycle track should be turned into a cycle lane — the National Cycle Manual says that cycle lanes are ok when speeds are under 30km/h but on the nature of the road it is unlikely that speeds will be kept under 30km/h most of the day and the council should be aiming higher to make the route suitable for children to use. If the council want the cycle route to be friendly to school children, the cycle lane should be turned into a segregated path / track and should be inside the cars, not outside it as currently shown. 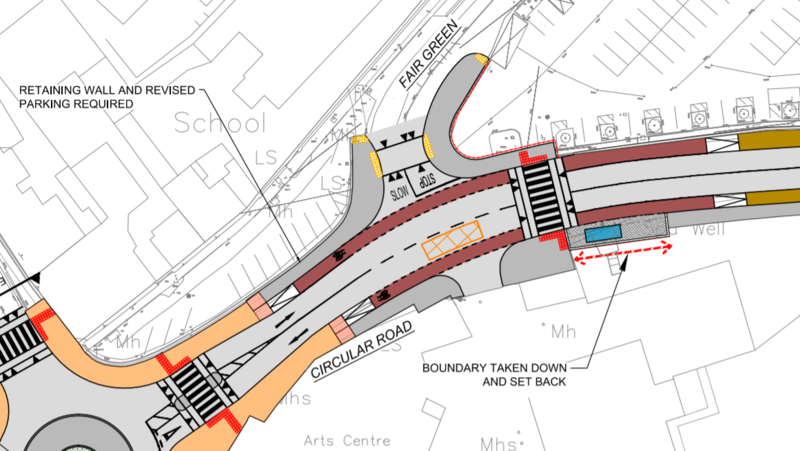 Ideally the cycle track should also be part of the raised treatment at these minor junctions. This roundabout is marked as constructed in 2017, so, there is little point commenting at this stage. It can be viewed on Street View. 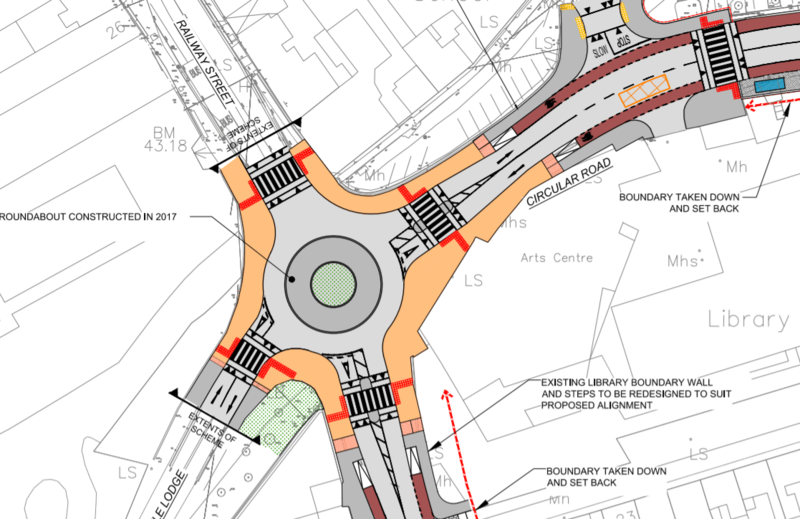 The design between the roundabout zebra crossing and the second zebra crossing is also largely already in place. 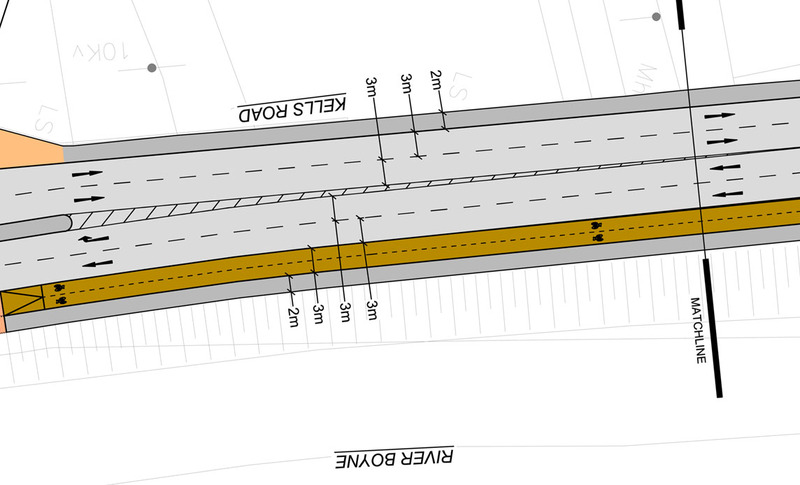 This looks to be a big improvement to what’s there but on the current drawings the wrong cross-section is included, so, it is hard to tell what lane widths there. The segregation needs to be heavy here given the curvature, slops, and lack of road frontage and walled-in design on one side, both of which likely increases speeds. An alternative which would simplify the design and flow for cycling would be to have a fully-segregated two-way cycle path on the north side of the street (top of image). 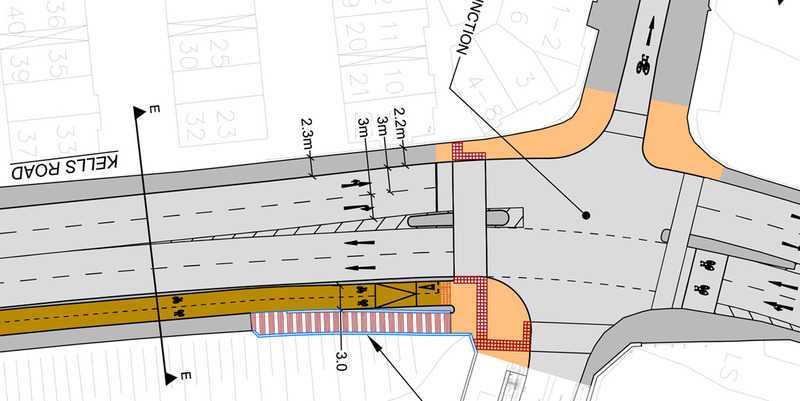 The two-way cycle path could run from the planned two-way cycle path (shown in the top right of the image) to the roundabout constructed in 2017 (shown in previous images). 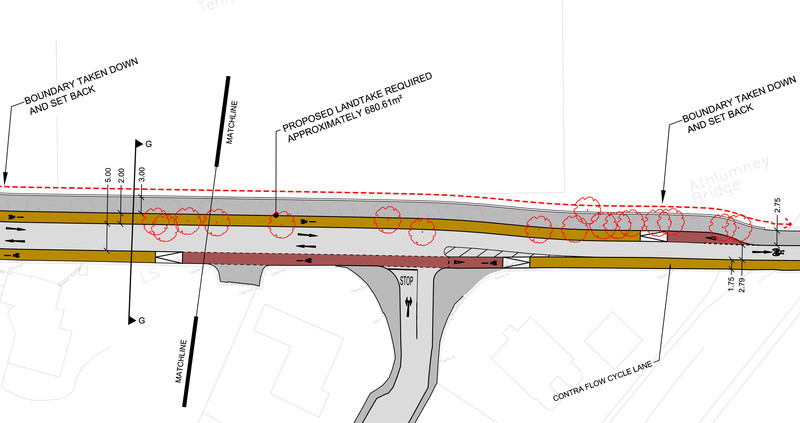 Given the nature of the Kells Road as a major road, the planned two-way cycle path on riverside does not have enough horizontal separation. It should be at least 1-2 metres wide. This might seem impossible given that the space allocated, but if the road was reduced two three lanes (straight on lanes and turning right-hand turning lanes), it would allow for greater safety and would unlikely have much impact on the capacity of the road. There should be two-way cycling access from the river-side of this junction into Market Square (top leg of the junction). 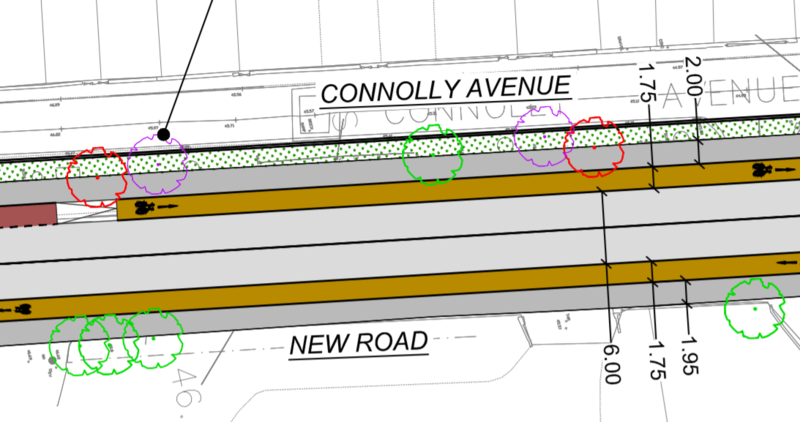 There is already a shared path solution under construction to link the Kells Road and the Convent Road (left and right respectively on the last image). The Convent Road starts with two-way car access before becoming one-way for cars and two-way for cycling. While speed tables are included at both ends of the section shown above, there may be a need for another speed table or one or two speed ramps to keep speed on this mixed section low. The contra-flow cycle path in this design allowed users to cycle it rather then cycle around the long way. The cycle track should not be lowered crossing private entrances (left of the junction above) — a raised cycle track could cross the driveway entrances. 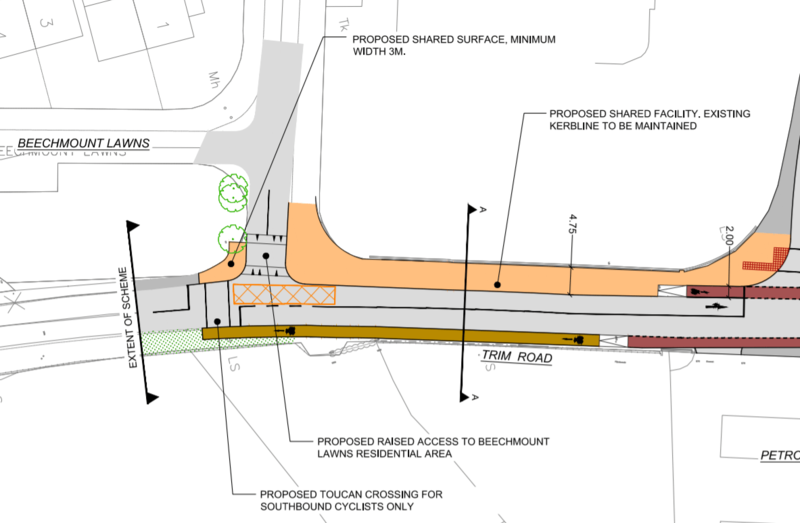 Keeping the cycle path raised across the junction should also be looked at. This is an example image from the National Cycle Manual shown a cycle track remaining raised passing a driveway. Are bollards or is heavier segregation needed to avoid the likes of household oil trucks or bin trucks from mounting the cycle track? As per the National Cycle Manual image shown above, the cycle track should remain as a raised track crossing a driveway. Unless bollards are to be used, it is a great idea to have the share traffic lane at the same level as both the footpath and contra-flow cycle track. Overall the routes just need tweeting and, with the right designs, then the routes might function as a cycle route for all ages and abilities. As part of IrishCycle.com’s CyclingForAll.ie campaign this article was used as a submission to the council on the project. Hello Cian, are you aware of the councils plan to cut down 22 mature trees on Convent Road? They also plan to demolish 300m of beautiful old stone walls to facilitate this design, the path is going through a medieval manorial village so basically the cycle path will destroy an area of historic importance and change the vista completely- thoughts? @bytheboyne — the loss of trees and a short section of old stone walls is unfortunate but the benefits of providing safe cycle routes, especially those suitable for children, seems to outweigh the loss and stone walls can be rebuilt and replacement trees planted. Where are the before and after images so we can understand what going to happen? As ever council plannerss don’t explain. Cian the cycle lane is going through a beautiful area of archaeological importance (two recorded monuments and one National monument) most of the town of Navan are against this destruction of our local heritage, I suggest you revisit your previous delight at such a plan and as a point of interest 300m of old stone walls will be demolished one dating back to 1756 surely not a short section as you have stated – have you ever visited this area?